When the mother of the child featured in my Helping Kids Be Brave post sent along this new picture, I couldn't help being struck by something about it. Maybe it was in her daughter's stance, in her eyes, or in her mother's acknowledgement that they couldn't take the picture until Jenni went to her room and got a pillowcase to complete the outfit because "details matter." There was something more than a cute kid in a nifty costume, some kind of sureness in her stance and her eyes. This kiddo had latched onto the Star Wars character Rey as a role model for more than just this one picture. Rey was (and is) a new option for Jenni when it comes to imagining herself in the world. 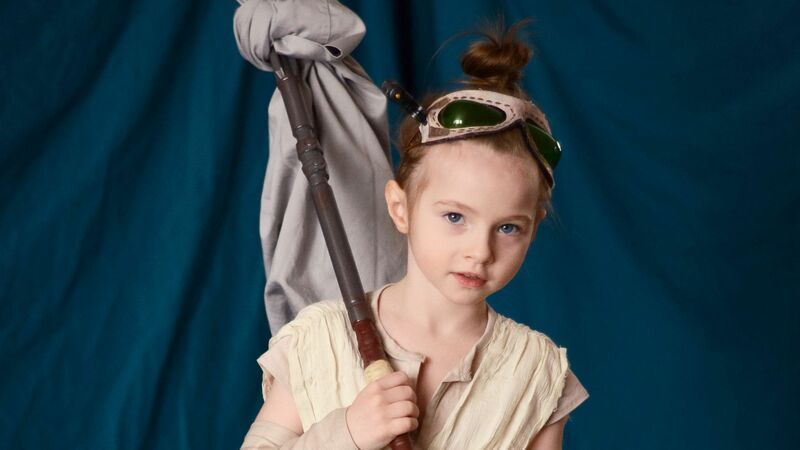 This little girl was ready for a fictional mentor, and Rey was there -- and not just there, but featured prominently in a popular blockbuster film. Rey was an available option in a film largely dominated by male characters. (And trust me -- as a former Princess Leia wannabe, I understand the joy of finding a female character who doesn't always need rescuing!) Jenni had someone to identify with, someone she could look to for options when sussing out tricky situations. Gender matters. Indeed, representation matters, because "If she can see it, she can be it." Our children's early experiences -- including the hours spent consuming media -- shape what they imagine to be possible for people who look like them, live where they live, or come from where they came from. Simply put, kids determine what they can be based on the examples around them. Our students know it. We should, too. I grew up in the rural Midwest, and very little that I read, saw, or heard in my classes or in the media represented my reality. There were no buses, subways, or malls where I lived. We were country kids, but not Little House on the Prairie country kids. The women that I saw in the media and read about were either urban or suburban, except for those rural women who always rode horses everywhere and lived on farms. I lived in an apartment and had never even been near a horse. My textbooks, the films I watched in class, and even the tests that we took used examples drawn from a totally different set of life experiences. No one "out there" looked or sounded anything like what I saw "back here." The subtle message I received was that the place where I lived didn't matter, and that my experience didn't matter. So what can we do to help children recognize that their reality does matter? Learn about your own culture and be ready to talk about it. Know why you're who you are because of where you came from. Know about the community in which you live (PDF). What’s important about it? What’s special? How does it connect to and reflect the cultures that lived there in the past and today? Think through the instructional materials that you use, with a specific eye toward the kids in your class and the community where you live. Are there positive examples of different races, roles, and levels of affluence? Do you include the full spectrum of gender, or only the binary? Take a look around your classroom. Does the decor reflect the languages and cultures of the students who sit in the seats? If not, ask them to help you create something to kick off the new year. Student work makes for great decoration -- and it's free! Representation matters. What our young people see around them positively or negatively shapes their expectations for themselves and for each other. When it comes to our classrooms and schools, let’s do our part to make sure that they can see themselves and all of their peers as strong, creative, capable, happy, and connected.